My job search is going well. This week, I am getting a lot done and following up on leads. My plan is to have the most time-sensitive activities taken care of this week, so that I can relax a bit and start working on some of my other projects more in the coming weeks. Eventually, I'll probably settle into a schedule in which I do most of my job search work in the morning and then work on other things in the afternoon. Last week was a different story, though. Petunia had to stay home from day care on Monday to finish recovering from her tummy bug. Hubby was sick but refusing to really take it easy at work, so pretty much a useless lump on the sofa at home. And I had a house to clean and a Thanksgiving dinner to get ready for! Also, I couldn't let Hubby touch any of the food, to minimize the risk that he might share our tummy bug with our guests. 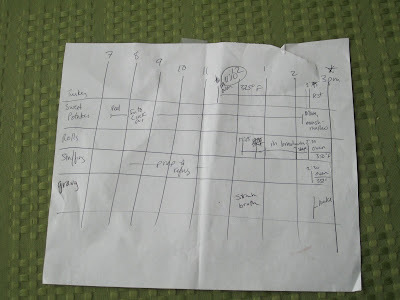 Maybe next year I'll type it up in some appropriate software and make a proper Gantt chart. hahaha, I love your Gantt chart! Very practical. But did you do a proper Work Breakdown Structure? And a Close-out report? Lessons Learned, Cloud? :) hehe. Love it! Wait -- where's the cranberry sauce!?!??! @Melba, I probably could write up a lessons learned document! This is one of the many reasons why I love you! I want to see the WBS, too. Is it CMMI L3? Do you have the proper evidence of task completion? And was it delicious? You are my hero. I bet you colour coded your study notes when you were in university. I don't ask Nick to do any of the cooking stuff on holidays. His job is the cleaning and entertaining B. I too made a plan of sorts (just a list of when things needed to be started/in the oven). Huge help to me this year was doing my turkey in the crockpot. It left my oven free to use. I also did a lot of things the night before (probably 5 hours worth of cooking and chopping) and it made the actual Thanksgiving Day a breeze! That is totally freakin' awesome! !